I enjoy reading books of a diverse variety and gaining insight and inspiration from the reviews and recommendations of others. At first I wasn't sure that I was going to like this book, or the series, but there was so much hype around it and it was so highly recommended that I couldn't resist giving it a try. Much to my surprise I was very glad that I did, it wasn't the typical historical romance and right from the beginning I knew that I wasn't going to be able to put this one down. There were, however, a few slow parts in the middle of the book, but they were necessary in creating the depth of the characters and building the plot I now can see looking back, and the second half without a doubt made up for it by keeping me constantly on the edge of my seat with fingernails chewed down to nothing! Outlander was full of suspense, action, a little mystery and a lot of history and romance but they were all mixed together in a lovely balance to create a very enjoyable, 5-star read! 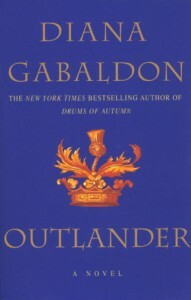 I can't wait to start the second book in the series and have already downloaded it on my Kindle and am going to check out the first season of the TV version as well to see if that will hold a candle to the print version, and am very much looking forward to viewing Jamie in the flesh, I won't deny!